A while back, I created an image showing the tenets of Bushido and relating them to the act of blogging. It was a picture I did for myself, something I wanted to get as a poster for my office as a reminder to maintain honor as a blogger. I put it up on the blog as part of a Doodle pack. Just a little bit of something I had been working on that I wanted to share with my friends and readers. It wasn’t something I expected to get a big reaction from. Honestly I never expect to get that much reaction from my doodles. They are just something I do. I got a reaction, though. More than I ever expected. I was sent messages and asked, flat out, if I would create a version of the picture that people could use as a blogging badge. At first, I didn’t know how to respond, so I just kept putting it off. After all, honor is a very personal thing. I don’t necessarily feel like I am able to tell someone if they have honor or not. It isn’t the type of thing you do. It’s not the type of thing I do. The idea, though, has stayed with me, floating in the back of my mind popping up every once in a while and fluttering to the forefront. I still don’t know exactly what I want to do about it. I don’t know exactly what honor means to other people. However, I also don’t want to deny anyone something they want. If I just put out a badge, though, it looses it’s meaning, at least it does in my mind. That’s why I’ve decided that I should probably give it something. That something needs to be unique to each person that claims the badge though. It shouldn’t be generic. It should be special. I am going to only ask for something very simple. 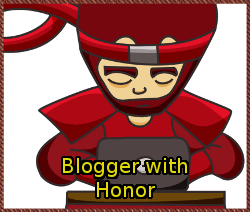 If you wish to use the Blogger with Honor badge, I ask that you define what that means to you, and link back to this post explaining where this all comes from. Honor is an important concept to me. It is more than just a set of rules or laws put down by someone way back in history. It is an understanding of my own personal views of right and wrong. I believe that there is a universal morality that goes beyond social laws and genetic imperatives. I believe that all of us have inside our subconscious the knowledge of what is right and wrong. We can sense when an act is inherently evil, no matter how justifiable that action may seem. It is the part of us that knows that genocide is evil. The part of us that feels pity, pain and compassion when we see abused animals and starving children on television. Honor is easy when you break it down to the very core: Do That Which is Right. Everything beyond that is cultural. It’s true that I spend a lot of time philosophizing over what the role of honor in our modern western culture is. It’s an on going effort that I might not ever actually fully understand. However, I feel that as long as I strive to find that meaning, I am on the right path. It is spiritual in nature for me. I seek the wisdom to know what is right, and the strength to act accordingly. Part of what that means for me as a blogger, and indeed as a writer, is to always be true to myself in my work. When I write, I want to do so from a place that is always me at the core. That might not be the best way to sell a story, but to do otherwise wouldn’t be honest. When I put something out on the internet, I do so because I believe that putting it there will benefit someone else or help me to gain a new understanding of myself. My life experiences should be shared because they might help someone else overcome their fear and anxiety. My opinions on things are opinions, and shouldn’t be considered anything more than that, but they also might show someone a different view. A view they might not have been able to consider before. Looking at something from all sides helps us better understand and make decisions for ourselves. I want everyone to realize that they have the ability to make decisions and use their voice. My views are just one side of the discussion. When I draw silly pictures, I hope that someone out there will look at them and smile. I want to entertain. I want people to read what I write and find themselves pulled away for a moment from their own trouble. To me, blogging with honor is simple. I write to make the world better. If only for a few fleeting moments, and if only for a handful of people. It is saying what I believe and doing what I feel is right. We only gain meaning from those that pass it to us. Guest Post – Tracy Mangold – Why, oh, Why God, do I do this to Myself? PRAISE BE! I will most certainly be using it and I MUST remember to do a post with your name on it when this #augustbreak stuff is over. This is awesome. Beyond awesome. Do it! I’d be proud! I loved this when I first saw it, and I love it even more now, that you are willing to share it with us. I fully intend to use it, and will post & link back to you gladly. I think it is so cool! I’m looking forward to reading it, and really looking forward to seeing the concept spread. Honor is too often forgotten in the modern times. I love how you have articulated such a valuable concept. When I was reading your reasons for blogging, be it by sharing your words or your drawings, I found myself identifying a common theme in the blogs I like to read: I read blogs that make me think, or that put a smile on my face, or that touch my life in some way — I like to read blogs that move me. In a way, in my mind, blogging with honor is sharing some of what moves each of us (and learning what to keep sacred and close to the heart too). Thank you for starting this conversation. It might make me sound like a troll, but the happiest I am is when I see something I’ve written spawn a pretty intense debate. There are multiple sides to every story, and I think it’s important we strive to see them all. I think doing the doodles and things like that are my way of spreading a little happiness to make up for all the anger that some of those topics can really generate. Hmm… Insight rage with a smile on my face and a song in my heart. Maybe I’ve been exposed to too much Doctor Who. Not a troll at all — I hear you and I feel the same way. This comment thread is fantastic and the honesty of blogging and writing is a great theme with which to end one week and start another. Thank you, again. Thank you. I am extremely excitedly looking forward to reading responses. I hope it is something that people can take to heart and make their own. Yay! I can’t wait to read it! Of course you can use the badge. All I ask is that you put up a post defining what it means to you to “blog with honor” and link back to this very post. Honor is a very personal thing, and I encourage everyone to figure out what it means to them. I’d also like you to email me with a link when you do. I’d like to put together a page linking all the Bushido Blogs together.